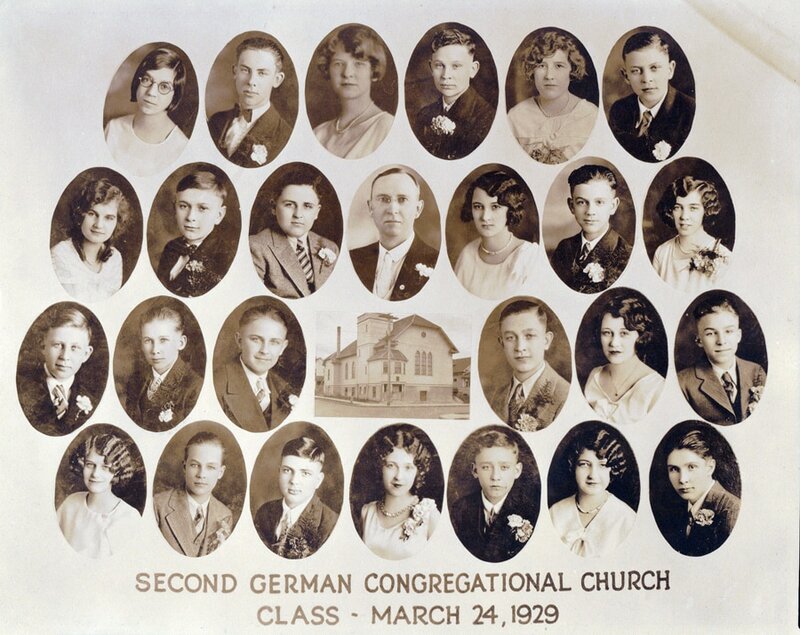 The Second German Congregational Church Confirmation Class of March 24, 1929. Top Row from left to right: Amelia Mill, Clarence Hein, ?, Edward Weitzel, ?, ? Third Row from left to right: ?, ?, ?, ?, Frieda Kell, ? Bottor Row from left to right: ?, Wilhelm Wensrich (1), ?, Elenor (Eleanor) Schmidt, ?, ?, ? Unidentified: Robert Bockel, David Gebhardt, Roland Hilderman, Ida Lenhardt, Helen Lind, Anna Maria Meisner, Jacob Nagel, Henry Reich, George Rossman, Alex Schneider, Wilhelm Schneider, Joseph Spreier, William Starkel, Esther Weitzel, Victor Weitzel, Melba Yost, Wilma Zorn. Photograph courtesy of Maria Hein, the daughter of Clarence Hein who is shown in the class photo. The Hein family home was located at the corner of NE 14th and Beech Street and was torn down in the 1960's to make way for the development that now house Whole Foods and the Albina Branch of the Multnomah County Library. Allison Wysocki identified Frieda Kell and Wilhelm Wensrich and provides the following information: "The Kells were German and came from the Volga village of Holstein. The name was originally "Koelln" and then became "Kelln" and was eventually shortened to Kell at some point." "Wilhelm Wensrich was born in 1915 in Calgary to Johannes Wensrich and Maria Katharina Hilderman (his mother was from Holstein). His family moved from Calgary to Portland in 1922." ​Allison Wysocki identified Eleanor Schmidt.